Alternative Projections: Experimental Film in Los Angeles 1945 - 1980 is Los Angeles Filmforum’s exploration of the community of filmmakers, artists, curators and programmers who contributed to the creation and presentation of experimental film and video in Southern California in the postwar era. Please visit the Alternative Projections website, the culmination of three years of research into the archives of film venues and organizations. The website includes oral histories, a research database and documentation of the films, exhibitions, organizations, and collaborations that defined this prolific era in experimental film and video making. Alternative Projections now has a new book by the same title, distributed by Indiana University Press in the USA and Combined Academic Publishers in the UK. 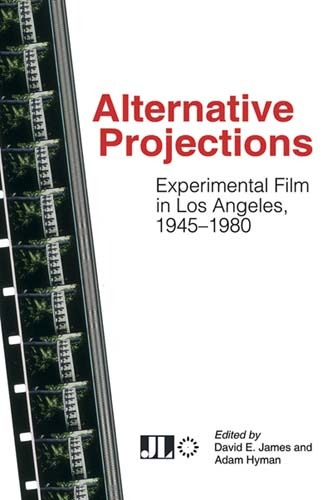 Alternative Projections: Experimental Film in Los Angeles, 1945-1980 is a groundbreaking anthology that features papers from a conference and series of film screenings on postwar avant-garde filmmaking in Los Angeles sponsored by Filmforum, the Getty Foundation, and the University of Southern California’s School of Cinematic Arts, together with newly-commissioned essays, an account of the screening series, reprints of historical documents by and about experimental filmmakers in the region, and other rare photographs and ephemera. The resulting diverse and multi-voiced collection is of great importance, not simply for its relevance to Los Angeles, but also for its general discoveries and projections about alternative cinemas. See more at the Indiana University Press page. It's available to order at any bookstore and available frm online vendors and at our screenings.